What would it be like to have our clean up targets mapped? Global Alert—a novel effort of citizen participation created by the Ocean Recovery Alliance—targets the 7 million tons of garbage that gets into the marine environment every year. 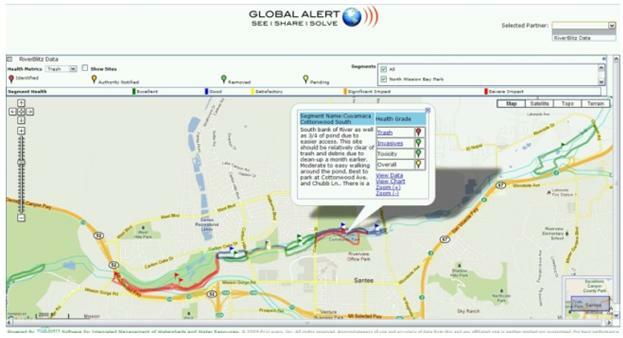 Set to launch in early 2012, the platform will use technology available to any smartphone and existing mapping technologies and give anyone the opportunity to upload “visual snapshots” of trash hotspots. Debris data will be added to customized Google maps, allowing communities to monitor waterways for cleanliness or dirty ways. As scientific data is layered in, the maps will hopefully “empower” community groups and local, national and international agencies to reduce trash in waterways. I am writing from an organization called The Rozalia Project for a Clean Ocean. We recently released a report that we wrote regarding marine debris and possible interactions with whales. Our organization is dedicated to cleaning up the world’s oceans and teaching others to do the same. Would you consider publishing our report on your blog? I can be contacted at rebecca@rozaliaproject.org. Thank you!